Fylde based commercial and domestic gardening service serving a large area of the North West including Lytham, Fylde, Wyre, Preston, Ormskirk and Wigan areas. Jake Kidde-Hansen and Martin Worswick is specified as the websites creator. Copyright (c) 2010, Classic Gardens is the owner of the copyright for this website. three profiles were found for Classicgardens.org in social networks. Among other social networks the website is represented in Facebook, Twitter and LinkedIn. The web server with the IP-address 91.224.108.20 used by Classicgardens.org is run by Dark Group Ltd and is located in Great Britain. 48 other websites are located on this web server. Most of them are provided in the english language. 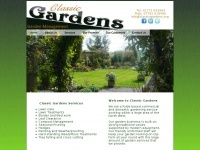 The websites of Classicgardens.org are served by a Apache server. The markup language of the website is XHTML 1.0 Transitional. The visitor analysis software Google Analytics is used to analyze the visitors of the websites. Both the inclusion of the website in search engines and follwoing of its hyperlinks is explicitly allowed.